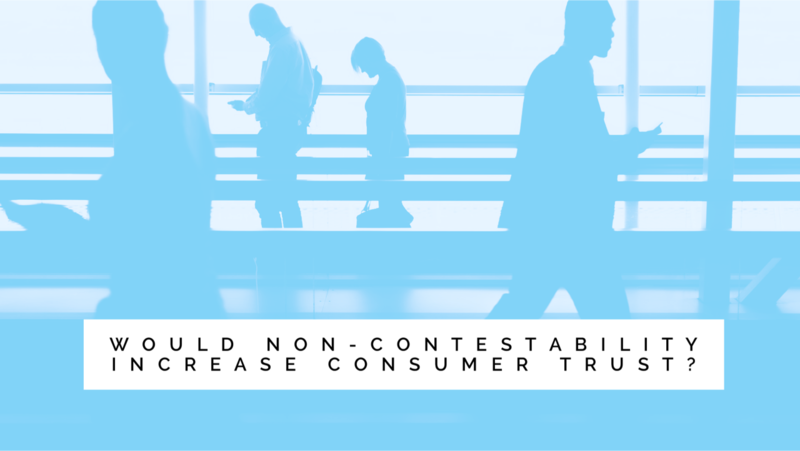 Would non-contestability increase consumer trust? In this bonus Big Read article, Melissa Collett, Director of Fairer Finance, talks about non-contestability. Would non-contestability help life insurers win back consumer trust? At the recent conference, protection industry veteran Peter Le Beau used his last speech as Protection Review chairman to call for non-contestability to be introduced in the UK as a way of ‘getting over the issue that nobody trusts us’. ‘Non-contestability’ refers to where a life insurance claim cannot be refused after a policy is in force for a certain number of years, usually two. The non-contestability rule applies in the United States, Australia and a number of other jurisdictions but not in the UK. The introduction of a five-year non-contestability rule in life insurance policies was proposed by the Law Commission in its consultations on insurance law reform in 2007 and then in 2009, citing its use in other jurisdictions. However, the proposal was dropped amid criticism by the Association of British Insurers (ABI) that it would be unworkable and would encourage fraud. Other stakeholders were in favour, including the Financial Ombudsman Service (FOS) which saw the brunt of the disputes arising from insurers refusing to pay life claims due to alleged non-disclosure at application stage. Often policies were in force and premiums paid for years, only for consumers to be told at the point of claim, after a loved one had died, that a policy was invalid. Due to industry opposition, non-contestability was not pursued by the Law Commission in order to retain support for the principal reforms, which were ultimately brought into law in the Consumer Insurance (Disclosure and Representations) Act 2012. Although the 2012 Act was a huge step forward from the old draconian law which allowed insurers to void a policy for any non-disclosure regardless of consumer knowledge or intent, it still does not entirely protect consumers who unintentionally make mistakes on their application form, without any fraudulent motive. There is still a small but significant number of life claims that are turned down each year, estimated at 1-2%. When a claim is turned down this can have a devastating impact on surviving family members, compounding their grief and anguish at an already difficult time. Even though it happens relatively rarely, even a small chance a life insurer could deny a claim is extremely damaging to consumer trust. According to polls, most consumers think insurers pay out only 71-80% of claims compared to the actual rates being between 98-99%. Given how important it is for consumers to protect themselves from financial shock arising from tragedy, the belief that insurers pay out only 71-80% of claims is a worrying statistic. It is likely to be a major contributing factor to the protection gap – the extent to which people are uninsured against the financial consequences of ill health and death – which is estimated at £2.4 trillion. Johnny Timpson, Industry Affairs Manager at Scottish Widows says, ‘Trust must be earned and continually re-earned’. Non-contestability would be a way of giving customers a cast-iron guarantee that a policy will pay out – no ifs or buts. A change in law is not necessary for companies to offer this, but given their track record so far, it is unlikely to happen without legislative change. Obviously, there are details to be worked out and a greater understanding of the practice in the US and elsewhere, as well as the structural issues in the UK that might work against it. But given the pressing need to increase consumer trust, it’s time to re-open the debate. Now you've read Melissa's article - please vote in our latest poll about non-contestability.